Home Car Pictures Bane meme turned into a “wash me” funny finger drawing! It seems that Tom Hardy did a great job when it came to play the role of Bane in Batman – The Dark Knight Rises, because now, you get the chance to see funny Bane memes that command people even when they’re just drawings on cars :D; I just wish they have drawn a funny Batman too..
Another car owner had been surprised with his very own finger drawing made by drawing artists with awesome drawing skills who hate the simple wash me writing on a dirty car. That expressive drawing with Bane’s face and mask can amuse anyone who went to the cinema when Batman – The Dark Knight Rises aired. 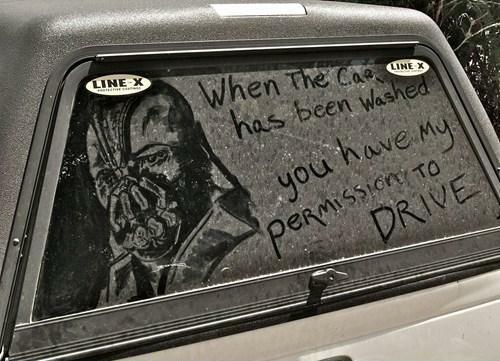 When the car has been washed, you have my permission to DRIVE! This is a funny auto article for those who don’t know anything about the existence of car washes but be careful when it comes to this Bane meme; You should listen to Bane and get dirty, try to wash the car on your own because he won’t give you permission to drive it unless it’s clean! Jeremy Clarkson, the man who knows everything about the auto world, i hope that you will get this funny photo in the Top Gear series’s email because everyone should smile a little when seeing a funny car photo like this one even if it’s not quite a car care example. At least this masterpiece isn’t out of date because we get to see a new movie character, Bane! See what happens when you don’t want to take care of cars?? Bane appears and starts giving orders and sh%^t like that 😀 ! Due to american auto laziness, people got the chance to see funny photos like this one and turn them into great car jokes about car cleaning. Next articleZombie wars or end of the world? This modified Chevrolet Spark can handle both!